In 2000, Ken was working for a dot com in San Francisco as a web producer. A few weeks after a layoff, he decided to go clear his head with a mountain bike ride among the Redwoods in the San Francisco Peninsula. On a downhill descent, he did an acrobatic endo with a superman dismount and rotating flip. If there had been any witnesses, the German judges would have given him an 8.5. 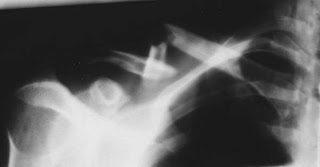 He landed on his shoulder with such force that the ligaments holding his shoulder in place snapped apart. When a couple of other mountain bikers happened upon him, they asked, “Are you okay?” “Yeah, I’m fine,” he said with part machismo and part denial. He rode his bike uphill, one-handed for two miles back to his car. He struggled for about 15 minutes trying to figure out how to get his bike back into the trunk of his compact Corolla. He drove himself to the hospital and waited in the E.R. for four hours on a Saturday night only to learn that he needed to make an appointment with a specialist. Ken wore a sling for a five days until the doctors performed the five-hour surgery. Apparently, we are born with an extra ligament behind the shoulder blade. So, in their wisdom, they not only removed the damaged cartilage and repaired two ligaments, they also used that extra ligament as reinforcement. They had good intentions. They had no idea how often his shoulder would be tested in the future. Two days after his surgery, he woke with a high fever and blisters all over his body. He had contracted Chicken Pox in the hospital. The combination of the pain and the pox interfered with his sleep for two weeks. 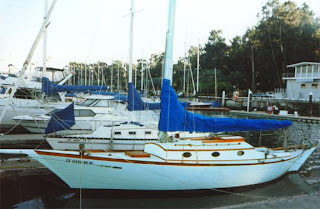 Ken lived on a 33-foot sailboat with a low ceiling, no head (toilet) or running water. He slept in a narrow berth of this 50-year old vintage vessel. Maneuvering around was a royal pain those first few weeks. When a storm blew in, he had to go out and secure the dock lines with his good arm and constantly check the bilge for leaks with a flashlight the entire night. 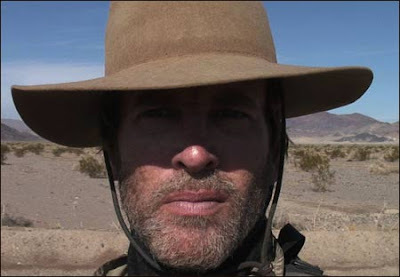 Three years later, he went mountain biking on the Pacific Crest Trail in Tahoe. He fell again on the same shoulder. A hiker stopped to see if he needed help. He borrowed her cell phone to tell his parents, “I’m fine. Don’t send Search and Rescue, but it’s going to take me a while to get home.” He rode the remainder of the two miles of trails one-handed again. Then he rode another 13 miles on the pavement back to his car. He must’ve looked pretty bad because a woman in a black Suburban offered to give him a ride. “She looked a little afraid of me, but also concerned,” he recounted. “I said I was fine.” He lied – again. “I stunk so badly and was so hungry that I showered and ate before I went to the emergency room,” he said. An X-ray revealed he broke his collarbone in three places. The ligaments where he had his previous surgery were so strong that there was no give for the bones when the impact happened. No surgery required this time. They sent him home to heal. 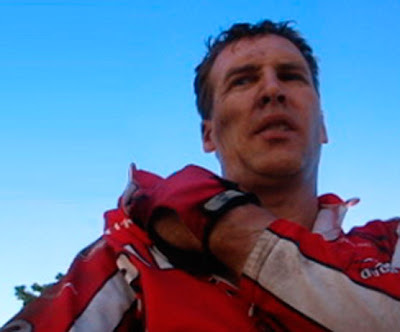 In 2006, this daredevil went for a mountain bike ride on his road bike in Laguna. His skinny tire didn’t give when he hit a deep rut. Any guesses what he landed on? The same right shoulder. He broke his collarbone again in the exact same spot. Nothing they could do, but send him home to heal. Hopefully, the third time was the charm and he’ll never, ever hurt this shoulder again. “Were you ever afraid to get back on the mountain bike again after everything you’ve been through?” I asked. “No, not at all. I keep my mountain bike in the back of my truck in case it ever breaks down while I’m working on my film in Death Valley,” he answered. Ken thrives on adventure. On a whim, he bought a road bike and rode it 550 miles from San Francisco to Orange County for a family party. He regularly explores Death Valley National Park for weeks at a time without any assistance. These are the times when his family and loved ones wish those surgeons implanted him with a GPS chip instead. His treks to Death Valley are also the reason he never wants to accept any help. Every hardship is an opportunity to train for his next adventure. NOTE: If you have a good comeback story, please contact me at sixtwothreetries@gmail.com. I’d like to interview you. I hope this will be the first of many Comeback Kid stories. Here’s why.